Easter in our house means kitchen cupboards filled with chocolate eggs and treats of every description. We always plan a family easter egg hunt at home for the boys and whilst we don't like to go overboard and buys toooooo many chocolate eggs, we do like to have little prizes they can win throughout the day which helps to stagger their sugar intake. 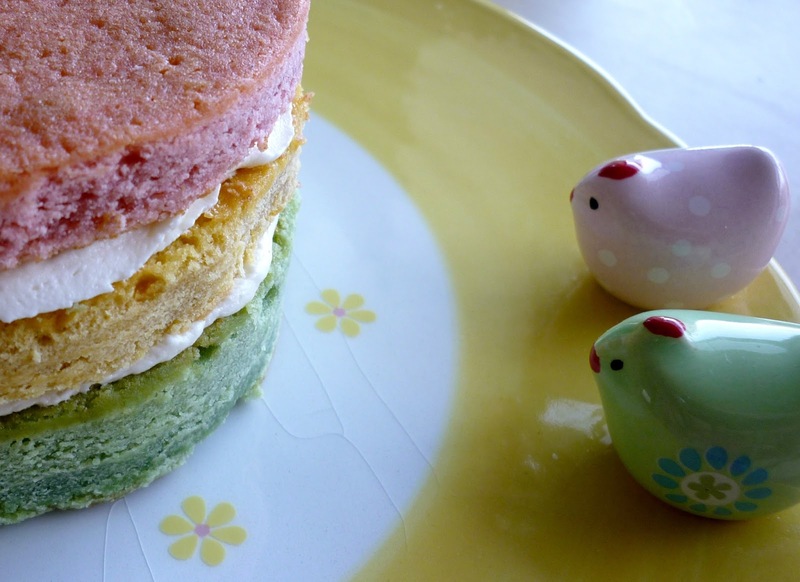 I wanted to make something a little different this year and I had some leftover cake batter so I decided to use my pastel colours and create an alternative easter rainbow cake. As this was leftover cake batter it had been sitting around for a little while before I decided how to use it and inevitably I overworked the batter once adding my colours so it turned out a little dense, but still pretty tasty. It's easy to fall into the trap of overmixing your cake batter so normally when I'm making a rainbow cake from scratch, I switch to using using the good old wooden spoon mixing method right after I've added my flour. This helps to ensure you don't overwork the gluten as you inevitably have to ensure your colour is mixed in properly. The thing I love about rainbow cakes is the element of surprise the recipient gets when they cut into the cake. 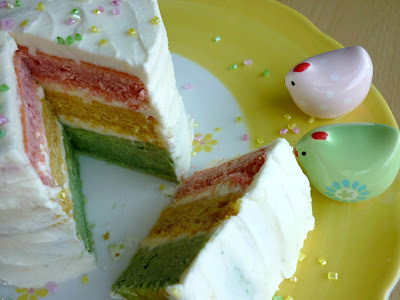 You can make them in any colour combination and I have skipped over adding a pictorial how to guide as my lovely mate Kerry from Kerry Cooks has done a splendid one which includes a spectacular cake spanning the colours of the rainbow. My cake is topped with a classic vanilla buttercream and sprinkled with some coloured sugar to match my sponge. And check out the cuter than cute cake stand my bestie bought me. 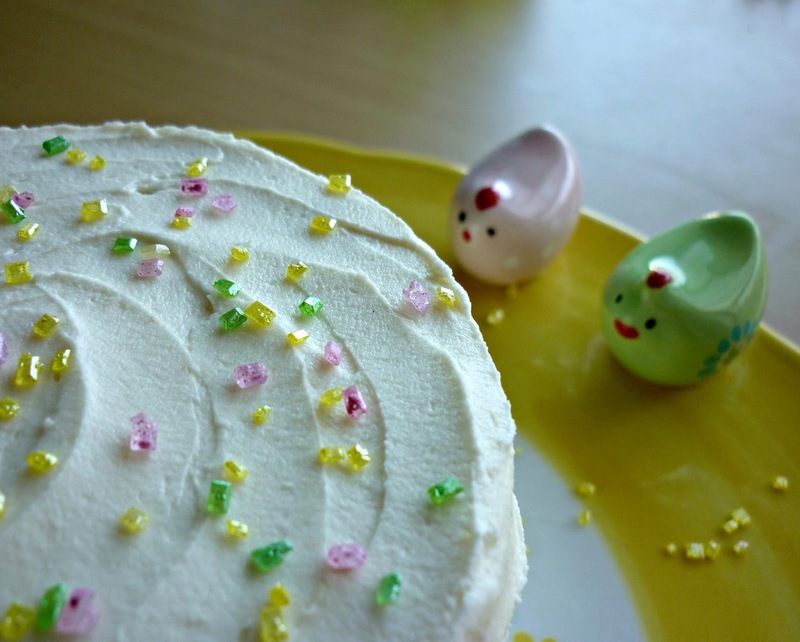 The little chicks are attached to the plate and I just love how they seem to be eager to take a bite of cake! Line 3 x 6" tins with greaseproof paper and heat oven to 160c. In a large mixing bowl, beat together sugar and butter until light and fluffy. Add eggs one at a time combing well between additions. Add vanilla extract or any flavouring really! In a seperate bowl, mix flour and baking powder and using large spoonfuls, add the dry mix to the wet batter mix. I use my stand mixer to cream the wet batter and then switch to using a wooden spoon when adding the flour and colours so as not to overmix. Add milk and and combine well. Divide mix into 3 bowls and colour using a gel paste colour like these Progels (my favourite brand). Put each colour in a different tin and bake for approx 20-30mins, every oven is different and I check for 'doneness' by touching the top of the sponge. If it springs back, it's ready. If it leaves an impression it's not quite done! Once baked, cool on a rack and then fill and decorate with buttercream! I always make buttercream using a 2:1 icing sugar to butter ratio so 100g of unslated butter to 200g icing with a dash of milk and vanilla to make it creamy and dreamy! Store any leftover cake in an airtight tin.